An old expression advises: “the sting of the nettle is nothing compared to the pain that it heals”. Nettle is useful for a whole range of complaints such as rheumatism, seasonal allergies and the early stages of prostate complaints in men. It is a natural diuretic so if you use this herb regularly be sure to eat foods high in potassium like bananas and fresh vegetables. Recommended Use: Helps to relieve seasonal allergy symptoms and rheumatic complaints. Directions: Adults: take 2 mL, 3 times per day. 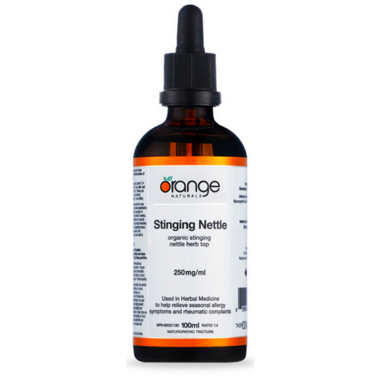 Ingredients: Each mL contains: Stinging Nettle (Urtica dioica, 1:4 herb top extract) 250mg. Non-Medicinal Ingredients: 40% grain alcohol; purified water. Over the past few months, I began with some allergy type symptoms - watery, itchy eyes. I have been using this for about 3 weeks now and the symptoms are mostly gone. I'm happy with the relief so far! I'm continuing to take it daily. I have a confession: I'm allergic to my 2 cats. But what can I say, I just love them so I live with the allergies. Usually I take Reactine to cope, but with a bit of research I found that Stinging Nettle (and Bromelain) are suitable alternatives. I've been putting this in my water for a week and I truly see a difference!